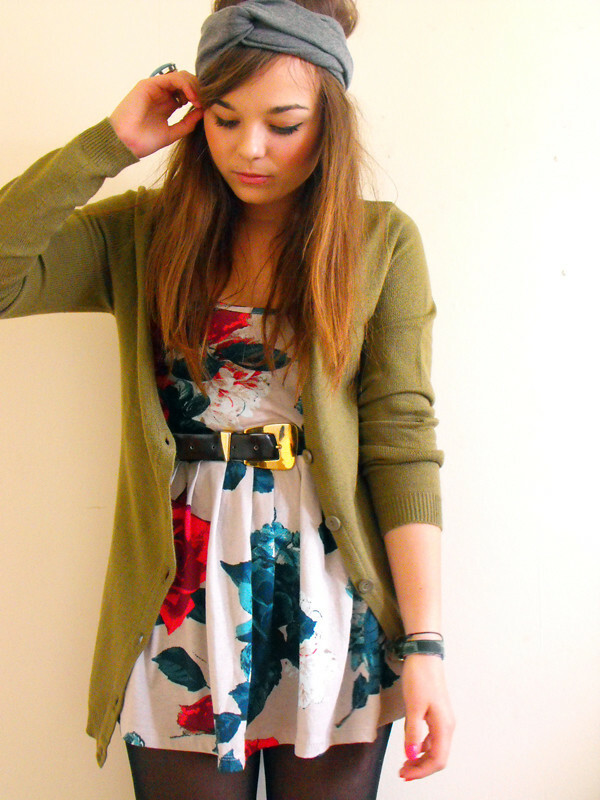 Another outfit post, and another containing that green cardigan! I just cant seem to get enough of it! And again I'm wearing colours that I wouldn't normally choose! I picked this dress up from Primark for about £5, and I'm thinking of going to see if there is anymore in the same style. Like that Lilac polka dot dress, Primarni has come up trumps with a dress that really suits my shape! I like the dress because I can wear it in the summer and the winter as I can imagine it layered up with all sorts of things! I cant remember the last time I wore a belt either, I don't like to cinch in my waist, as much as all the mags + Gok tells you to do, I think it just makes my tum stick out more! Topshop have come out with a few things over the last few days that I really need in my life! I'm really loving their latest online collections, But the price is really turning me off, I've got 3 items in my basket and it comes to £95. Oh the price of fashion! I might leave it a while before buying them, But I know I'll cave in eventually! Ive decided I need to give Primark/H&M/New Look a break for now! If your interested I what I'm coveting this Peter Pan Collar Tunic, this Asymmetrical Hem T-shirt, and this oh so gorgeous Peter Pan Lace Collar Dress. I think the last one could be the dress I posted about when I was talking about the Topshop S/S Collections! A few of you know I'm going on holiday on the 29th for two weeks, and I was wondering if you want me to "pre shoot" (I really cant think of a better expression, brain is dead today!) some outfits and schedule some posts for while I'm away. I am taking my Macbook with me while on holiday, Id go mad without catching up on my daily websites! But I doubt I'll have time to shoot/write/edit posts while I'm there! I cant resist the sun! Anyway back to the point! Should I do a few outfits to go up, or would you prefer me to just do them as I wear them and just not post while I'm away? Either way let me know in the comments or something! ALSO. I'm really annoyed Lookbook has deleted yet ANOTHER of my most hyped looks! Yesterdays look was nearly up to 300 hypes and was flagged for deletion because it didn't show to my knees! Its ridiculous to be fair seeing as most of my looks on their haven't been deleted and are shot in the exact same way, I am aware it needs to be head to knees shot, but surely a inch above my knee isn't gonna harm anyone? Ahh what a wonderful dress - I'm sure I'll be visitng Primark soon. Belt makes this outfit! Ohh I LOVE the dress! I cannot believe it's primark?! So so beautiful, the print is gorgeous! 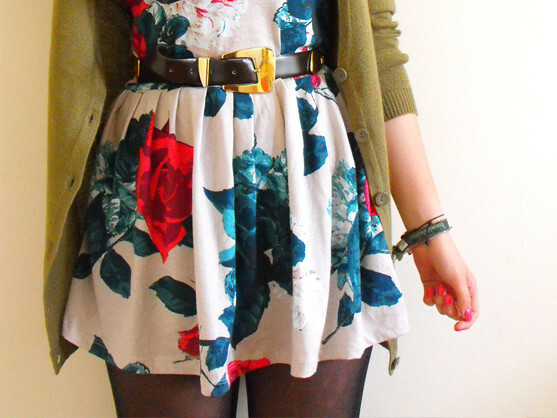 Such a wonderful mix of colour and I like how you have paired it with your olive cardigan. Hope you have an amazing holiday, i'll miss your posts! Take lots of photo's please! cute! i haven't been into primarni for so long, but i am actually hating topshop at the moment. the quality is terrible but the prices are getting higher by the day. This is a lovely outfit! I wouldn't have a thought to put these colours together but they somehow work. The military green I'm really loving at the moment; no wonder it's turning into a staple. i love your cardigan!!! i really need to find some like it!! your dress is so pretty and the price was great!! your hat is so cute as well i hope you have a great holiday! Great Topshop links! I'm totally obsessed with Peter Pan collars! ive yet to go inside a topshop store, but i love everything on the website! Just started all this blogging malarky and i love your blog! That dress is gorgeous, the colours really POP! 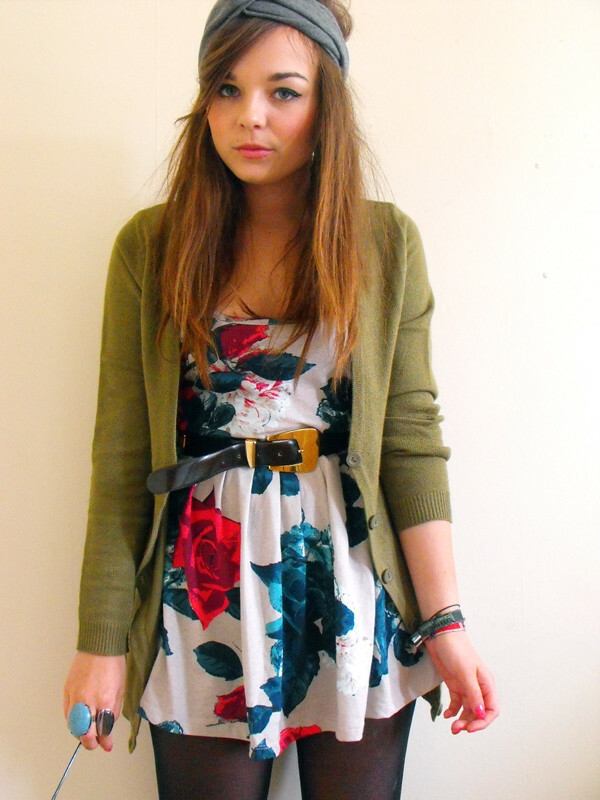 Primark is amazing for dresses at the moment! That is such an annoying part of Lookbook. . . I saw this on twitter, tweeted by Chictopia - great look! That is ridiculous. I read in the forum once about how people love flicking through new with the karm off and justr flagging looks.. Kind of sad.